Ethics and International Relations (IR), once considered along the margins of the IR field, has emerged as one of the most eclectic and interdisciplinary research areas today. Yet the same diversity that enriches this field also makes it a difficult one to characterize. Is it, or should it only be, the social-scientific pursuit of explaining and understanding how ethics influences the behaviours of actors in international relations? Or, should it be a field characterized by what the world should be like, based on philosophical, normative and policy-based arguments? This Handbook suggests that it can actually be both, as the contributions contained therein demonstrate how those two conceptions of Ethics and International Relations are inherently linked. 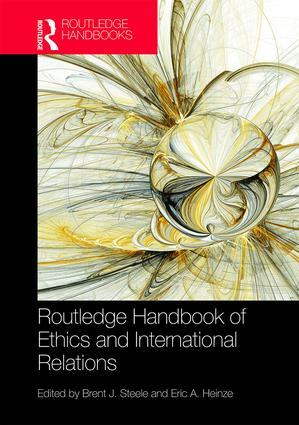 Drawing together a diverse range of scholars, the Routledge Handbook of Ethics and International Relations provides a cutting-edge overview of the field by bringing together these eclectic, albeit dynamic, themes and topics. It will be an essential resource for students and scholars alike. Brent J. Steele is Professor and Francis D. Wormuth Presidential Chair in the Department of Political Science at the University of Utah, USA. Eric A. Heinze is Professor in the Department of International and Area Studies at the University of Oklahoma, USA.